The Department of Geography and the College of Social and Behavioral Science invite you to hear from Dr. 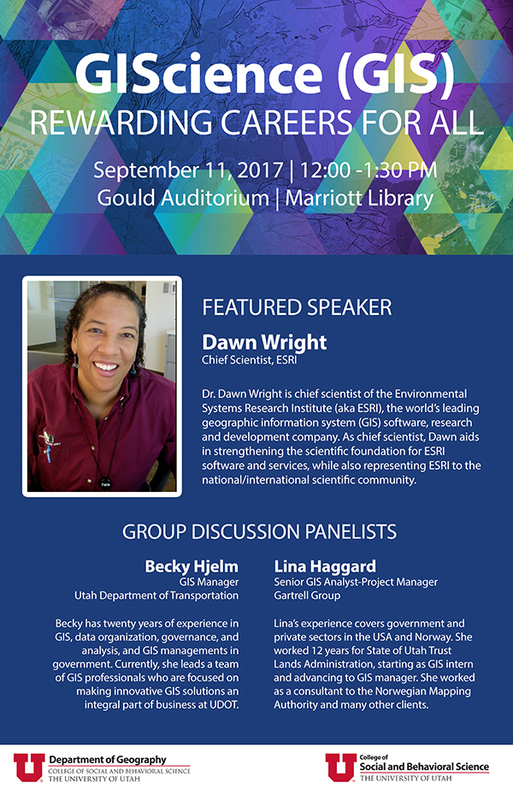 Dawn Wright, chief scientist at the Environmental Systems Research Institute (ESRI). She will discuss the role of GIS and geography in the future of scientific endeavors in many fields. She will also relate her experiences and insights into making a career in GIS. Following her address, Dr. Wright will be joined by Becky Hjelm, GIS Manager for UDOT, and Lina Haggard, Senior GIS Analyst-Project Manager for the Gartrell Group, for a discussion on how students can prepare and achieve a career in GIS. For questions or more information, please contact George Hepner at george.hepner@geog.utah.edu.